Sunset on another edition of the Bridge to Bridge! Thursday, August 31 welcomed the 20th edition of the Ronstan Bridge to Bridge Race hosted by the St. Francis Yacht Club with 39 entries: 26 hydrofoil kites, 8 windsurfers and a handful of cats and moths. 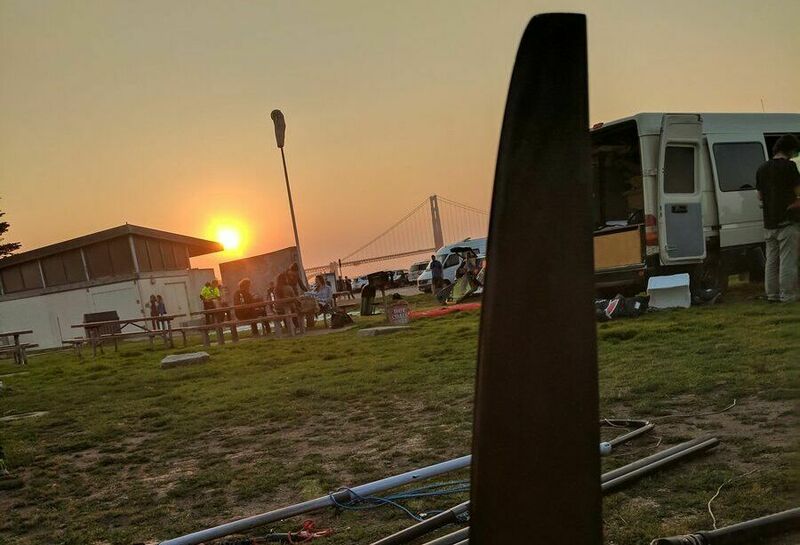 This event is an all-out drag race from the mouth of the San Francisco Bay, under the Golden Gate Bridge, and downwind to Yerba Buena Island at the foot of the Bay Bridge. Anything can happen, and it usually does. “Race what you got, and run it hard” is the motto of the Bridge to Bridge among those who know it well. There are no official rules, but there are some unwritten ones that you’d better adhere to if you want to finish. Rule #1 – Get to the starting line. At the last minute, I switched from my foiling kiteboard to my windsurfer, as getting to the starting line was rapidly looking like the main priority. With super sketchy winds at Crissy and a 3-knot flood tide, anything less than a 13-meter kite wasn’t going to get anyone even close. I rigged up my Avanti 9.2 rig on a Mikes Lab 89cm wide board with 59cm kashy fin. That was enough to get me to the Bridge with enough time to take a few downwind runs across the start line. Others weren’t so lucky—a 40ft catamaran, Smart Recruiters, flipped just inside the Gate and turtled within a minute. Several foiling kites went down in the lighter breeze outside the Gate, and stayed down. You can’t win the race if you don’t get to the starting line! The starting gun sounded in 10-12 knots of breeze and quickly filled into the low teens as the fleet approached the middle of the Bay above Alcatraz. The foiling kites sent it the deepest looking like they might do the whole race in one tack. I tried to keep up with the foiling windsurfers but they too were sending it 10 degrees deeper than I could hold on my XL slalom set-up. As the puffs filled in from behind, I caught some but this race was going to be won at the end. Rule #2—Stay out of trouble. On the approach below Alcatraz to the Bay Bridge, two outbound freighters split the fleet and a Blue & Gold ferry joined the mix to create additional chop and traffic. “Stay out of trouble and keep on the tack that takes you toward the finish line,” I reminded myself. Sure enough, I connected a few puffs from behind and was right up there in the mix with Xavier Ferlet on the foiling windsurfer. Rule #3– Get to the finish line. The top kite foilers looked like they were just making it across the finish line but the wind bubbles above Yerba Buena Island were leaving lots of kites high and dry. For the rest of us, this was still a race. We sailed through a graveyard of downed kites a quarter mile from the finish line. I realized then that the only chance of ticking off more competitors would be to come in hot from the outside. I gybed back to line myself up for the last move of the game. If I could call it right and catch the final puff, I’d go from zero to hero. Chris Radkowski on the F4 foil and windsurfer had the same idea and was coming on strong behind me as a puff carried us down to the finish. Within 10 seconds, Xavier, Chris and I all crossed the finish line. It was a bit anticlimactic to slog across the line in 2nd, but that still beats not making it across at all. I’m not positive on the number of finishers but nearly three-quarters of the fleet had to be rescued as the light wind and flood tide proved to be too much. The 10:31 record still stands, set by kiter Rikki Leccesse in 2016. Johnny Heineken, Daniela Moroz and Joey Pasquali took the line honors on the foiling kite boards & 15m+ kites. A huge thanks to Ronstan and the St. Francis Yacht Club for continuing the tradition. Next story Kona windsurfing takes Clearwater by storm! Previous story Riding high after my first try at foiling!